When I first learned how to make savory bread recipes, it was before I had accumulated so many recipes. I always loved garlic bread and the flavors of so many different spices. My idea was to make some bread with a mixture of these herbs. I wanted to use a bread dough made with yeast but this was before I learned how to make yeast bread. 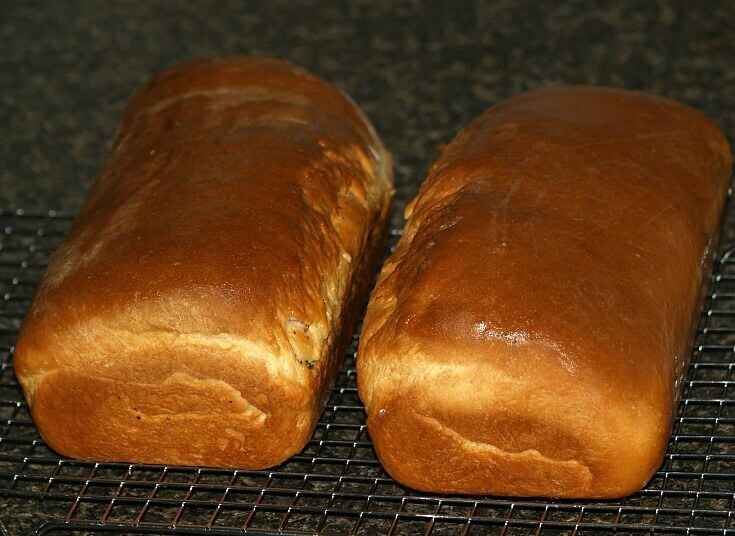 When I was young I started my bread making using frozen bread from the supermarket. 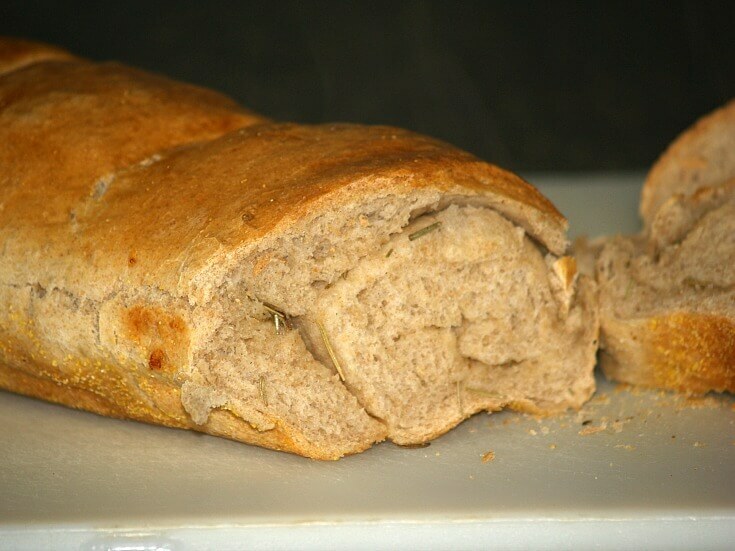 To learn how to make savory bread recipes, I decided to experiment with frozen bread dough. Rather than trying to add the herbs into the dough, I thought I would roll the dough and spread it with herbs. This really worked out quite well. I would make mixtures of my favorite herbs and almost always adding some onion or garlic. I would then add this mixture to softened butter or different types of cheeses. After rolling thawed bread dough into a triangle, I would spread over the dough whatever mixture I wanted. I never really measured my mixtures back then. I mostly went of looks and fragrance. Even the size was not predetermined simply my mood at the time. Sometimes I would shape long narrow loaves, sometimes the loaves fit into my bread pans and sometimes I folded the dough over and then shaped into round loaves. Since I first learned how to make savory bread recipes I have tried adding other flavorful ingredients like spinach, chopped meats and olives. However “unprofessional” back then, the result was always delicious. 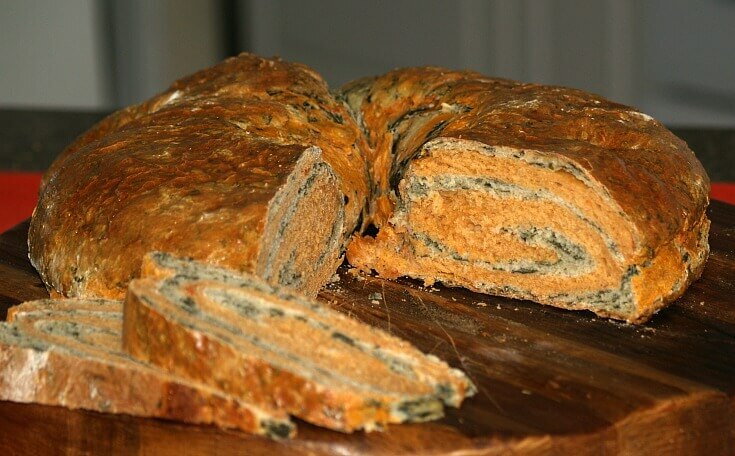 I am telling you this so you will know how easy it is to learn how to make savory bread recipes. Of course the frozen bread is easier and faster but nothing is as good as homemade bread from scratch. The following recipes might be a little time consuming but well worth the effort. Learn how to make savory bread recipes by rolling bread dough. Combine yeast, water and honey in a large bowl; let stand 5 minutes until foamy. Add the buttermilk, 1 ¼ cups all purpose flour, whole wheat flour, 2 tablespoons oil and salt. Blend mixture thoroughly gradually adding in enough to make a stiff dough. Knead dough until smooth and elastic about 4 minutes; place dough in greased bowl turning to coat. Cover with plastic wrap and let rise in warm place until double about 1 hour. Lightly grease loaf pan (9X5 inches); in small bowl combine parsley, oregano, fennel and pepper. Punch down dough and knead on a lightly floured surface. Roll dough out to rectangle (9X12 inches); reserve 1 teaspoon of the cheese and set aside. Sprinkle remaining cheese over triangle; sprinkle herb mixture over the cheese. Roll dough up jelly roll style beginning at the short side; place seam side down in prepared pan. Cover with clean cloth and let rise until doubled about 1 hour. Brush top of loaf with 1 teaspoon oil and sprinkle with remaining cheese. Bake 35 minutes or until loaf is brown and sounds hollow when tapped. Remove from pan and place on foil; bake 5 minutes longer for crispy crust. Cool on rack; makes 1 loaf. Learn how to make savory bread recipes by adding flavorful ingredients to the dough. Stir together the water, yeast and honey in a large mixing bowl; let stand 5 minutes until foamy. Stir in 1 ¼ cups all purpose flour, whole wheat flour, milk, oil, pepper and salt. 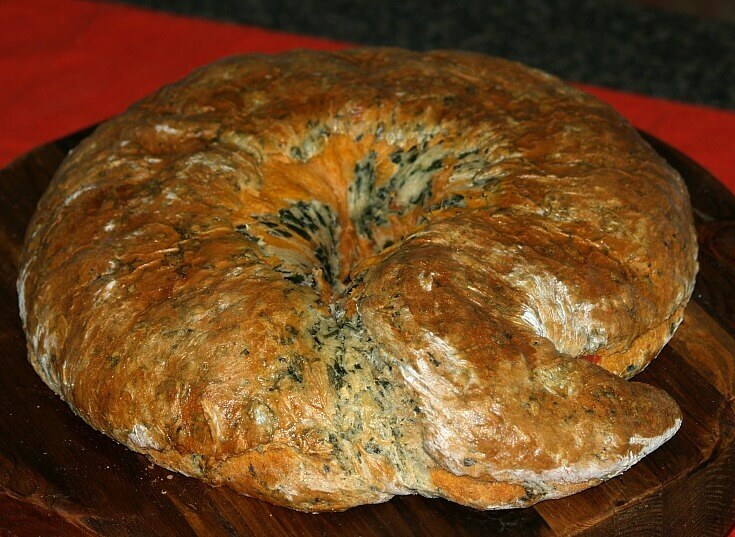 Beat with mixer on low speed until well blended; stir in the cheese, olives and enough flour to make a stiff dough. On floured surface knead until smooth and elastic about 4 minutes; place dough in greased bowl turning to coat. Cover bowl with plastic wrap; let rise in warm place until doubled about 1 hour. Lightly grease baking sheet; set aside. Roll dough out to rectangle 9X13 inches; roll up jelly roll style beginning with the long side. Place loaf on prepared baking sheet seam side down; cover and let rise 1 hour until doubled. Cut slashes diagonally across loaf about ¼ inch deep and 1 inch apart. Bake for 40 minutes or until golden brown and sounds hollow when tapped. 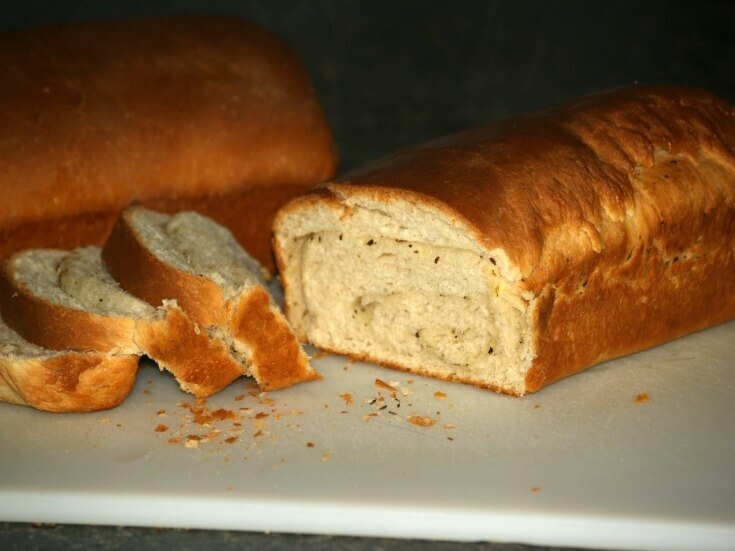 Learn how to make savory bread recipes with oats and wheat germ. Combine 1 ¼ cups flour, oats, wheat germ, basil salt and yeast in large bowl; blend well. In small saucepan heat water, oil and honey until warm about 120F degrees. Add warm water to flour/oat mixture blending on low speed of mixer until well blended. Stir in whole wheat flour and enough all purpose flour to make soft dough. Knead dough on floured surface until smooth and elastic about 10 minutes. Place dough in greased bowl; cover with plastic wrap and cloth towel. Let rise in warm place until doubled about 45 minutes. Grease large baking sheet; sprinkle with cornmeal; combine and blend all FILLING ingredients. Punch dough down and divide in half; roll each part into rectangle 15X12 inches. Spread HALF of filling onto each rectangle to within 1 inch of edges. Beginning with the short side roll up in jelly roll fashion; pinch edges to seal. Place seam side down on prepared baking sheet; cut 2 slashes in top of each loaf 1/8 inch deep. Cover with clean cloth and let rise until doubled about 45 to 60 minutes. Bake 30 to 35 minutes until loaves sound hollow when tapped; cool on wire rack. 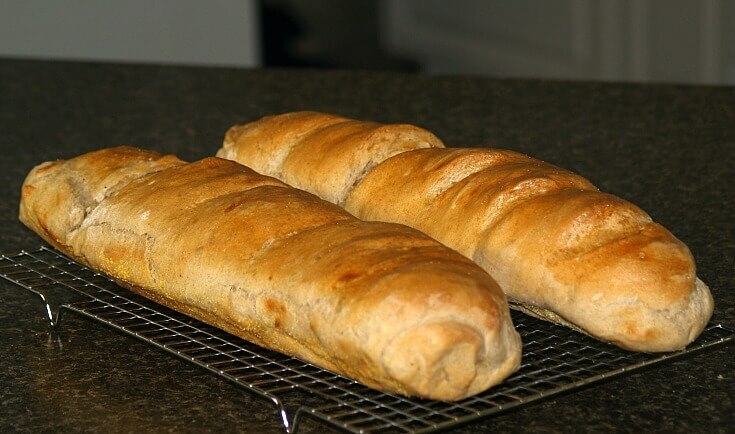 Learn how to make savory bread recipes with whole wheat flour. Combine and blend the flours; measure 3 cups of flour mixture into large mixing bowl. Add yeast and sugar to the bowl; heat water, salt and butter to 115F degrees and add to bowl. Beat on low speed of mixer about 3 minutes; stir in enough flour to make a soft dough. Turn out onto floured surface and knead until smooth and elastic about 7 minutes. Place dough in a greased bowl; cover and let rise in warm place until double about 1 hour. TO MAKE FILLING combine all ingredients and blend well; set aside. Grease baking sheets; sprinkle with yellow cornmeal; set aside. Punch dough down, divide in half and let rest 10 minutes. Roll each half into rectangle 15X12 inches; spread HALF of filling on each rectangle. Roll up jelly roll style beginning with long side; pinch edges to seal and place seam down on pans. With sharp knife make slashes across top of loaves every 2 ½ inches; cover and let rise until doubled. Mix egg white and water and brush over the loaves; bake 20 minutes. Brush loaves again with egg white mixture; return to oven. Bake another 15 to 20 minutes until golden brown; move to rack for cooling. 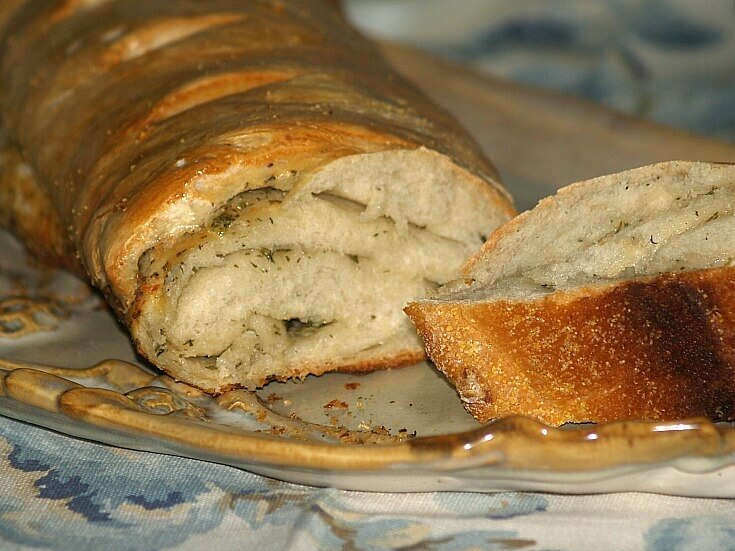 Learn how to make savory bread recipes with caraway, onion, basil and other great flavors. In large mixing bowl combine 2 cups of flour, sugar, salt and dry yeast. NOTE: Shortening does not have to be melted. Add the eggs and warmed milk to the flour mixture. Beat on low speed of mixer until well blended; stir in remaining flour to make stiff dough. Knead on floured surface until smooth and elastic about 3 minutes. Place in greased bowl turning to coat all sides. Cover and let rise until doubled in bulk about 1 to 1 ½ hours. MAKE HERB BUTTER: Combine all ingredients in small bowl and mix until well blended. Punch dough down and divide in half; roll each portion out to a rectangle (15X9 inches). Spread HALF of herb butter on each rectangle; from short end roll up jelly roll style. Place rolls in prepared pans; cover and let rise until dough reaches top of pan (1 to 1 ½ hours). Bake for 30 to 35 minutes and golden brown in color; makes 2 loaves. Learn how to make savory bread recipes with this recipe using sour cream sauce mix. Sprinkle yeast and sugar over warm water in large mixing bowl. Add to yeast mixture the salt, onion flakes, oil and sauce mix; stir to mix. Gradually add flour to make stiff dough; knead on floured surface until smooth and elastic. Place dough in greased bowl, cover and let rise in warm place about 45 minutes. Grease baking sheet; sprinkle with cornmeal and set aside. MAKE FILLING by combining all ingredients; blend until well mixed. 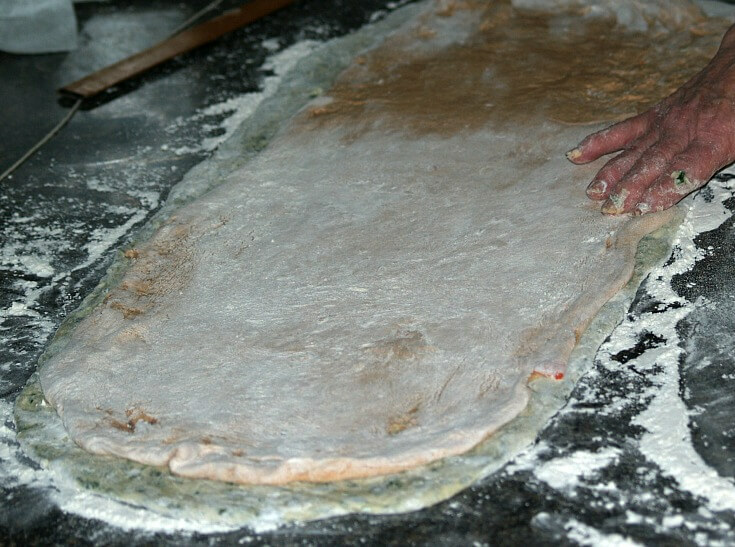 Roll dough out to a rectangle (14X10 inches); spread filling over dough. Starting at the 14 inch side roll up jelly roll style. Pinch edges to seal and place seam side down on prepared baking sheet. Cover with clean cloth and let rise until doubled about 45 minutes. With sharp knife cut 6 slashes diagonally across loaf ½ inch deep. Bake 35 to 40 minutes until light golden; REMOVE FROM OVEN. Brush loaf with the beaten egg white and water mix; RETURN TO OVEN 5 minutes. Move bread to rack to cool; makes 1 loaf. 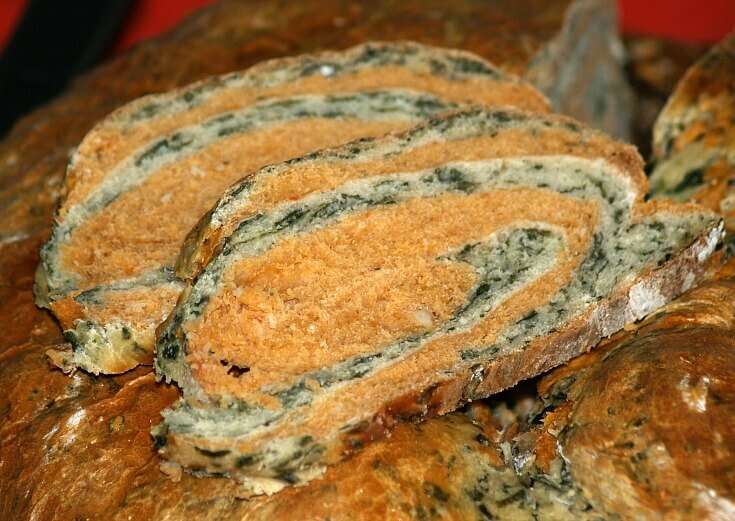 Learn how to make savory bread recipes with spinach and tomato flavors. In small saucepan combine potatoes, garlic, cold water, basil, oregano and ¼ teaspoon salt. Bring mixture to a boil over medium heat; cook uncovered until potatoes are tender (10 minutes). Drain potatoes RESERVING ¼ cup of liquid; mash potatoes with garlic (Should have 1 1/3 cups). In large bowl combine yeast, sugar and lukewarm water; let stand 5 minutes until foamy. Stir in mashed potatoes, reserved cooking liquid, 2 teaspoons salt, milk and oil. On low speed of mixer beat in 3 cups of the flour; gradually add enough remaining flour for soft dough. Divide dough in half; transfer to lightly floured surface. 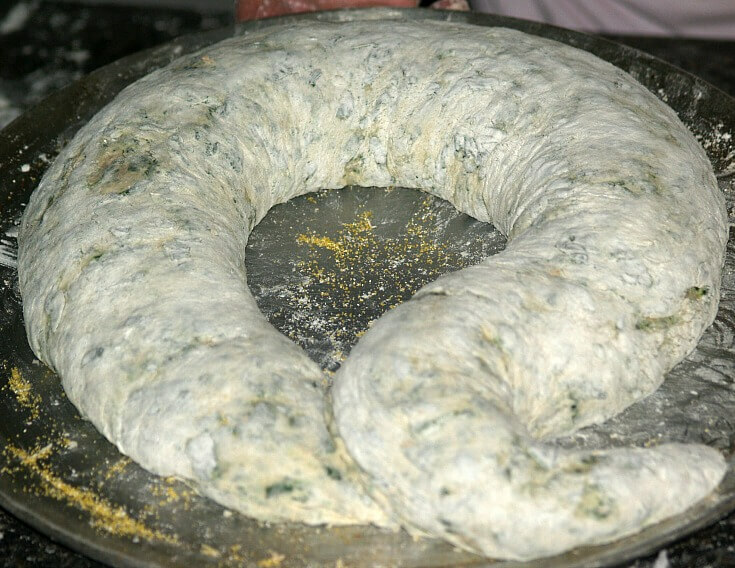 Knead spinach into half of the dough until smooth and elastic and well combined. Transfer SPINACH half to lightly greased bowl; cover with plastic wrap and let rise until doubled in bulk. Knead tomato paste into remaining half of dough; place in another greased bowl, cover and let rise. Lightly grease baking sheet; punch spinach dough down on lightly floured surface. Pat spinach dough into rectangle (12X14 inches); place tomato dough on top and pat to 12X13 INCHES. Roll the 2 layers together jelly roll style to form loaf 6X13 inches; place on baking sheet seam side down. Cover loosely and let rise 30 minutes until light. Brush loaf with beaten egg and water; bake 50 minutes until loaf is golden brown and sounds hollow when tapped. Cool on wire rack; makes 1 loaf. NOTE: For my loaf pictured, I rolled the dough longer so I could shape a Q. Roll both doughs Together. I rolled Mine in a Q Shape.